19 January 2006 Updated: 7 April 2006 Updated: 24 June 2006 One of the most decorated American combat soldiers in history. He enlisted in the US Army at age 17 for service in World War II. Received battlefield promotions while capturing more medals than any other US soldier, including the Congressional Medal of Honor. Following the war, he turned to acting in movies, starring in the story of his life , "To Hell And Back." He died in an airplane crash in Virginia while on a business trip and was interred in Section 46 at Arlington, a site overlooking the Tomb of the Unknowns. Rank and organization: Second Lieutenant, U.S. Army, Company B 1 5th Infantry, 3d Infantry Division. Place and date: Near Holtzwihr France, 26 January 1945. Entered service at: Dallas, Texas. Birth: Hunt County, near Kingston, Texas. G.O. No.. 65, 9 August 1945. 2d Lt. Murphy commanded Company B, which was attacked by 6 tanks and waves of infantry. 2d Lt. Murphy ordered his men to withdraw to prepared positions in a woods, while he remained forward at his command post and continued to give fire directions to the artillery by telephone. Behind him, to his right, 1 of our tank destroyers received a direct hit and began to burn. Its crew withdrew to the woods. 2d Lt. Murphy continued to direct artillery fire which killed large numbers of the advancing enemy infantry. With the enemy tanks abreast of his position, 2d Lt. Murphy climbed on the burning tank destroyer, which was in danger of blowing up at any moment, and employed its .50 caliber machinegun against the enemy. He was alone and exposed to German fire from 3 sides, but his deadly fire killed dozens of Germans and caused their infantry attack to waver. The enemy tanks, losing infantry support, began to fall back. For an hour the Germans tried every available weapon to eliminate 2d Lt. Murphy, but he continued to hold his position and wiped out a squad which was trying to creep up unnoticed on his right flank. Germans reached as close as 10 yards, only to be mowed down by his fire. He received a leg wound, but ignored it and continued the single-handed fight until his ammunition was exhausted. He then made his way to his company, refused medical attention, and organized the company in a counterattack which forced the Germans to withdraw. His directing of artillery fire wiped out many of the enemy; he killed or wounded about 50. 2d Lt. Murphy's indomitable courage and his refusal to give an inch of ground saved his company from possible encirclement and destruction, and enabled it to hold the woods which had been the enemy's objective. Every year the noncommissioned officers of the Sergeant Audie Murphy Club honor America's most decorated World War II Soldier. More than four million people visit Arlington National Cemetery annually. The most popular spot is the grave of President John F. Kennedy. The second most visited site is the simple marker of a Soldier who served three years during World War II. During this time he became the most decorated combat Soldier of the war. Every June 20, a group of non-commissioned officers lay a wreath on the grave located across the entrance from the amphitheater to mark his birthday. 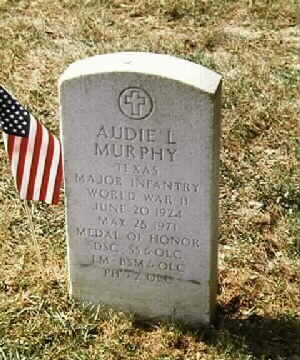 No equestrian statue, no tall monolith or large plaque marks the spot where Audie Murphy is buried. 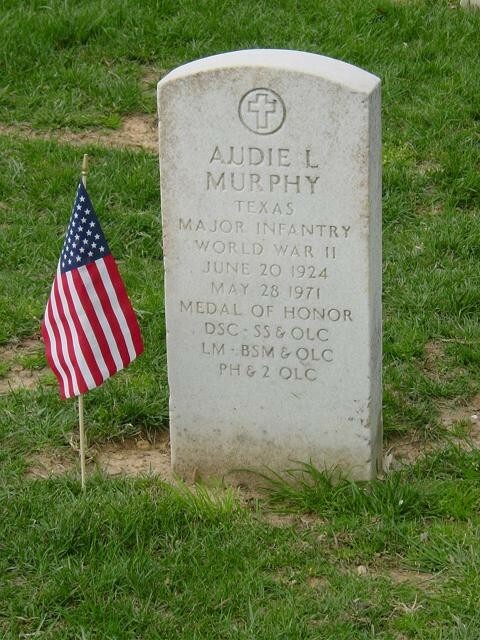 Tuesday members of the Sergeant Audie Murphy Club paid homage at Arlington to the Soldier who earned 33 medals during combat in Europe, including the Medal of Honor. The club was formed 20 years ago at Fort Hood to serve as a fraternity for outstanding Army NCOs. The club gradually spread Army-wide by 1994. 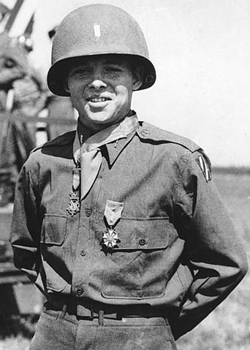 The organization is designed to recognize NCOs who personify the values exhibited by Audie Murphy. Murphy received every decoration awarded by the United States, some more than once. He also received five decorations from Belgium and France. The native Texan joined the Army after being rejected by other services because of his small stature. Orphaned at 16 and with only five years of formal schooling, he tried to join the Marines and then the paratroopers but his 5'5" frame and 110 pounds was deemed too small. The young Soldier was assigned to the 15th Infantry Regiment of the 3rd Infantry. He fought in North Africa, Sicily, Italy, France and Germany and along the way earned a battlefield commission. Six Panzers and 250 infantrymen attacked Murphy's platoon on Jan. 26, 1945 near the village of Holtzwihr, France. The lieutenant ordered his men to fall back to better defensive positions. He mounted an abandoned burning tank destroyer and sprayed the Germans with machinegun fire. Murphy, though wounded in the leg, remained at his position and killed 50 of the enemy single handedly. His actions delayed the German attack and enabled him to lead his men in a counterattack, which drove the enemy from the village. These actions at Holtzwihr earned Murphy our nation's highest award for gallantry in action, the Medal of Honor. A new career was about to begin. 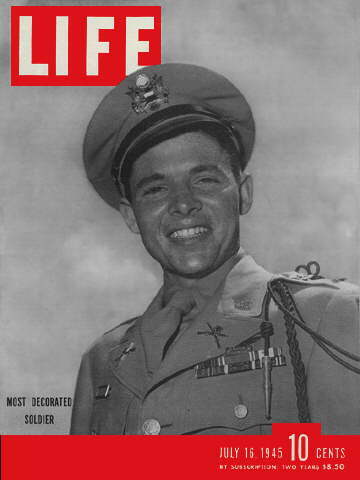 Murphy returned home to a hero's welcome and his photograph appeared on the cover of Life magazine. Actor James Cagney invited him to Hollywood. Murphy went on to appear in more than 40 movies, including starring in his autobiographical film "To Hell and Back." He also wrote numerous country and western songs. He joined the U.S. Army Reserves in Texas in 1950 and ended up a major, which is the rank on his grave marker. No one sees as much combat as Murphy did without complications. He suffered from Post Traumatic Stress Disorder or what was called "battle fatigue" in his day. The hero spoke publicly about the problem and urged the federal government to study the emotional impact war has on veterans. The then 46-year-old Murphy was a passenger on a plane on May 28, 1971, when fog and rain contributed to it flying into a mountain near Roanoke, Va. He was buried with full military honors on June 7, 1971.